Barcelona stalwart Sergio Busquets has called for patience on all sides with regards to Ousmane Dembele, amid ongoing speculation over his future. The 21-year-old has shown an ability to be decisive so far this season, scoring seven goals and providing three assists in 17 appearances in all competitions. In turn, from that perspective, he has emerged as an important player for coach Ernesto Valverde. However, as noted by Eurosport, he was recently dropped from the squad due to failing to report for training, and that in turn was unsurprisingly used as further ammunition to discuss a possible exit. Having struggled with injuries last season, his first at the Nou Camp after his big-money move from Borussia Dortmund, Dembele has shown improvement this year. 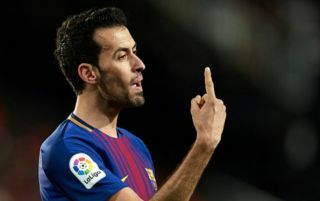 Nevertheless, Busquets has warned that patience is still needed with the Frenchman, as he is still ultimately adapting to a completely new style and life at Barcelona. “He’s young, he needs a period of adaptation,” he said, as noted by Mundo Deportivo. “If he plays a good game and gets two goals, he will not stay there either. Neither for good nor for bad. With the likes of Lionel Messi, Luis Suarez and Philippe Coutinho to offer elite-level quality in the final third, it should help with being patient with Dembele. Not to mention summer signing Malcom who continues to fight for more minutes too. However, while Busquets does make a fair point in that final judgments can’t be made on Dembele after just a season and a half, there does also arguably have to be a point where things click into place and it becomes clear that he’s capable of being a consistently top performer for the Catalan giants. From his goal against Atletico Madrid to his assist for Messi against PSV in midweek, he’ll be hoping that he’s continuing to build momentum and will be a regular fixture for Barca moving forward to prove his worth on the pitch where it matters most.